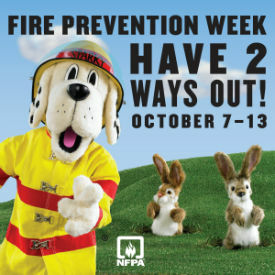 The Downers Grove Fire Department will be participating in the following events in recognition of National Fire Prevention Week. Station 5, 6701 Main St. The Department will open its doors to the public to experience a "Night at the Firehouse!" Take a station tour, see demonstrations of automobile extrication and rescue techniques, and get acquainted with the various uniforms and protective apparel worn by firefighters in a variety of emergency situations during the "Firefighter Fashion Show". Witness how quickly a fire can spread and the effectiveness of residential sprinklers in the side-by-side room demonstration. "Freddie" the robot fire truck will be on hand to visit with families, the fire safety trailer will be operating to help children practice escaping from fires, and children can practice making 9-1-1 calls with the real Downers Grove emergency dispatchers. Learn what you need to do to keep your family prepared and safe in the event of natural disasters. Parents can take advantage of visiting with the firefighters and learning how to keep their families safe from fire and other unintentional injuries common to children. Fire Prevention Week events will conclude with the Silent Parade, which pays tribute to all those who have lost their lives to fire and features fire department vehicles from many surrounding villages. All vehicles will display lights only; no sirens will be sounded. The parade will begin in Hinsdale at 7:00 p.m. and pass through Downers Grove at Main and Maple at approximately 7:15 p.m. People may assemble along Maple Avenue to view the parade and pay tribute by holding a flashlight as the cortege passes. The night will conclude with a memorial service and tribute to firefighters at Trinity Lutheran Church in Lisle, just south of Route 53 and Maple Avenue.